I recently started blogging using my iPhone, which brings a fair share of its pros and cons. The obvious pro is that I get to post things more frequently because of its convenience. The con, however, is that each post is shorter and somehow lacking substance. I’m not a big fan of lengthy blog posts anyway but it’s still nice to be able to provide useful content to the beloved readers, like a recipe or a tutorial, which is a little difficult to do (at least for me) when I’m writing something during, say, a quick coffee break. Anyway, I’m just rambling here. 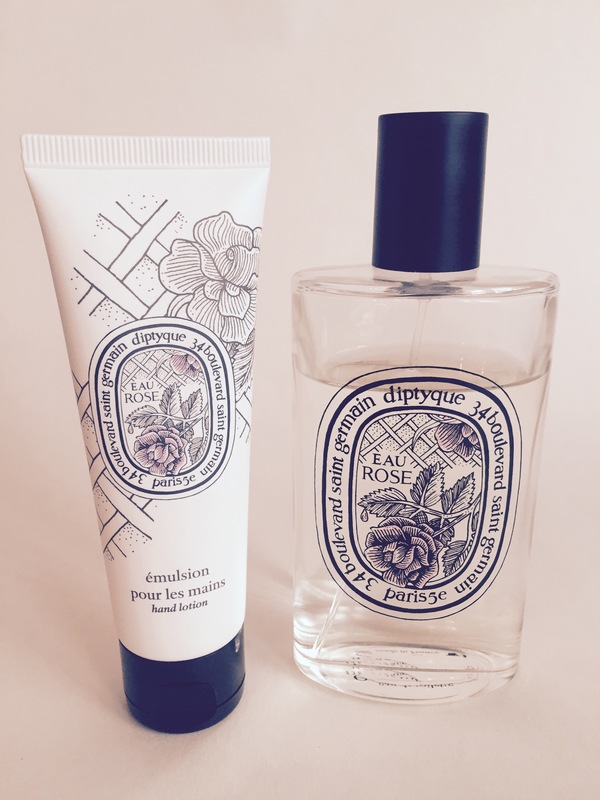 I don’t have anything interesting to say at the moment, except to share my excitement over this rose-scented fragrance by Diptyque that I purchased the other day. I actually only knew Diptype from the amazing candle collections but I came across its perfumes during my recent trip to Nordstrom. When I first sprayed Eau Rose on my wrist, I didn’t think much of it. But when I smelled it again on my drive home, I noticed how beautiful the scent transformed itself into — from a simple rose to a youthful, yet still sophisticated mixture of rose and lychee, with a little hint of musk. It was love at, well, second sight. The minute I got home, I ordered the perfume, along with Hand Emulsion. I still have my signature scent and this will not replace it, but it’s something I’ll be wearing when I’m feeling a bit playful during the upcoming summer months! I’m curious to know — what’s your favorite scent? I went to Jo-Ann’s the other day and while I was in line for a check out, I came across this lovely (and very strategically placed) magazine called Willow and Sage that features so many wonderful recipes for homemade bath and body stuff. I’ve never seen the magazine before but when I flipped through the pages and saw glossy photos of body scrubs and handmade perfumes, along with many other homemade beauty items, I knew I had to take it home. Immediately upon arriving home, I made these Rose Ice Facial Treatment. The recipe is rather simple — you just freeze the mixture of water, rosewater and rose petals in an ice cube tray. The recipe called for 1/8 cup rosewater, 1/8 cup filtered water, and a handful of rose pedals. The measurements listed in the magazine just weren’t enough liquid to fill even half the ice tray mold … so I mixed 1/2 cup each of water and rosewater together instead and filled the tray, and sprinkled liberal amount of rose petals. I’m glad I had all the ingredients on hand but you can get them at Bramble Berry! I rub the ice cube directly onto my face and neck after I come out of the shower. I do this every other day and I skip my regular toner altogether on the days I do this. I love it — it smells wonderful and give my skin an extra firmness … and it cost me next to nothing!